Evil acts, we like to think, are the preserve of psychopaths. Yet 30 to 40 years ago, a series of classic psychology experiments showed that the behaviour of ordinary people can be transformed in groups and that the most decent of individuals can be led to behave in the most indecent ways. These studies raise critical questions about the processes through which groups can transform us, and whether such transformations are always for the worse. Yet for decades it has been impossible to conduct studies with the same power as the classic studies and to interrogate their conclusions. The BBC Prison Study has broken this impasse and provides a surprising new set of answers with important social, clinical and organisational ramifications. Are groups ‘naturally’ bad for us? Of all the demonstrations that groups can change us, perhaps the most extreme was conducted by Philip Zimbardo and colleagues at the University of Stanford in 1971 (Haney, Banks & Zimbardo, 1973). In this, ordinary young men were divided randomly into prisoners and guards and placed in a prison-like setting. Very quickly, some of the guards began to act brutally. They set out to humiliate the prisoners and to deprive them of their rights. Within days, some prisoners began to develop psychological disorders. So severe were the consequences that a study scheduled to last a fortnight had to be terminated after only six days. The Stanford Prison Experiment (SPE) provided a grimly compelling portrait of the power of circumstances to shape behaviour. This is the main reason why its findings are well-known even beyond the boundaries of academia. But the SPE didn’t just show the depths that people can descend to in groups, it also sought to explain exactly what caused this descent. To those who ran the study, it illustrated a general tendency for people in groups to lose their capacity for judgement and agency and hence to become helpless to resist antisocial impulses. Groups are inevitably bad for you. Groups with power inevitably abuse it. Or, in the researchers’ own words, the aggression of the guards ‘was emitted simply as a “natural” consequence of being in the uniform of a “guard” and asserting the power inherent in that role’ (Haney et al., 1973, p.12). There are also moral reasons to doubt the ‘role’ explanation. It suggests that all of us would mindlessly abuse others if we were given roles that appeared to demand this. This denies the capacity for human agency and choice (Reicher & Haslam, in press). And it suggests that – whatever position they occupy in the social hierarchy – bullies and tyrants are passive victims of psychology who cannot be held accountable for their actions. In this way, psychological analysis easily ends up excusing the inexcusable (Haslam & Reicher, 2006). We have been stuck with this questionable explanation for a whole generation, because the behaviour that lent the SPE impact made it unethical to repeat. How can we advance understanding of the psychology of tyranny without ourselves being tyrannical? This was the dilemma that confronted us when we set to work on a new ‘prison study’ in 2001. This ended up being one of the largest experiments in social psychology since the 1970s. The study we conducted – referred to as the BBC Prison Study – was a collaboration between ourselves and the broadcaster. It was filmed by the BBC and televised in four hour-long documentaries in May 2002. Yet even before the study was run, and certainly after the documentaries were aired, the BBC Prison Study attracted considerable controversy – much of which was aired in The Psychologist. Was it just a piece of reality television with no serious implications? Can collaborations between the media and academia ever be of scientific value? Can broadcasting psychological research be ethical? These were valid fears. That is why we negotiated a unique contract with the BBC whereby we, the scientists, would design, run and analyse the research (as we would in any other study) while the broadcaster recorded and transmitted key elements of the research. The television documentaries themselves were not the full scientific story, but rather were designed to provide ‘a window on the science’: something that might get people interested and motivate them to find out more for themselves. However, the process of producing television documentaries moves much more quickly than that of performing scientific analysis and securing scientific publication. So, for a long time these documentaries were the primary form of information about the study that was in the public domain. It is only now that, in the words of The Guardian’s John Sutherland (2005), The Experiment has ‘crossed back into academia’. So it is only now that is it possible to assess the scientific merits of the exercise. Did it provide any worthwhile insights into the psychology of group behaviour and misbehaviour? And did it do so with a rigour that meets the standards required for scientific publication? This is a particularly pertinent question in light of the fact that the findings of the SPE were never published in a peer-reviewed psychology journal. The answer to the latter question is clear. The study’s key findings were first summarised in Scientific American Mind (Haslam & Reicher, 2005) and in a more detailed exploration of tyranny in the British Journal of Social Psychology (Reicher & Haslam, 2006). Additional publications also explore a broad range of social, clinical and organisational issues including agency (Reicher & Haslam, in press), stress (Haslam & Reicher, in press-b), leadership (Reicher et al., 2005) and organisational behaviour (Haslam & Reicher, in press-a). Indeed, to our knowledge, the study has generated more peer-reviewed publications than any previous social psychological field study. As to the former question – did the study provide any worthwhile insights? – the answer obviously depends upon the judgement of those who read our work. However, for us, one of the contributions of the study is already implied in the range of outputs it has led to. Characteristically, in our everyday studies, psychologists tend to focus on a narrow set of phenomena and collect a limited range of data. We thereby perpetuate arbitrary disciplinary divisions between domains that one might expect to be interrelated. In nearly 10 days of constant data collection – which incorporated observational, psychometric and physiological measures – we were able to examine how relations within and between groups developed and impacted upon each other. We also had space to investigate clinical and organisational as well as social psychological issues. We were thereby able to see how phenomena that are of core concern to us as social psychologists (notably, the presence or absence of a shared sense of social identity) are related to the mental well-being of individuals and the health of social systems. Although it has been hypothesised that there is a link between these elements (e.g. Ellemers et al., 1999; Haslam, 2001), no single study had demonstrated that the phenomena are interrelated, elucidated how they are interrelated, or explored how their relationship unfolds over time. In what ways, then, did the design of our study differ from the SPE? The study used the same basic set-up as Zimbardo’s study and divided people randomly into prisoners and guards. However, unlike Zimbardo, we did not act as prison superintendents who instructed the guards how to act. We simply set up a situation in which the guards had authority, had the tools of power and had better conditions (food, living quarters, etc.) than the prisoners. Our intention was to create a situation that was harsh and testing, but not harmful. In order to make sure we got the balance right, our study was also overseen by clinical psychologists and an independent ethics committee chaired by an MP. On the basis of social identity theory (Tajfel & Turner, 1979), we also planned a series of interventions designed to impact on the level of shared social identity among the prisoners and thereby to increase their willingness to resist the guards’ regime and any tyranny associated with it. Using systematic observation (aided by unobtrusive filming) and daily administration of psychometric and physiological measures, we then observed how both groups reacted. Although we set the study in a prison-like environment, our primary goal was not to mimic a real prison. That would have been impossible as well as unethical. What was real, however, was the fact that one group (the guards) had more power and resources than the other (the prisoners) – a feature that is also characteristic of a wide range of institutional environments such as offices, schools, factories, and so on. Our interest, like Zimbardo’s, was then to use our findings – and, more specifically, the theoretical analysis they support (Turner, 1981) – to comment more generally upon how people respond to social inequality. When do the powerful embrace inequality and abuse their power? When do the powerless succumb to oppression or reject and resist it? And what is the role of the group in these processes? What we found can be divided into two phases. At the start of the study, both groups felt distinctly uncomfortable with the exercise of power and with inequalities they encountered. This is understandable in the case of the prisoners. It meant that, as time went by, they increasingly banded together as a group in order to challenge the authority of the guards. It is, perhaps, somewhat more surprising in the case of the guards, who were never willing to embrace their position and exert their authority. So, rather than passive prisoners and brutal guards, we observed rebellious prisoners and ambivalent guards – some of whom were keener to befriend the prisoners than to punish them. Our participants showed no ‘natural’ tendencies to slip helplessly into role. The fact that the prisoners came to share a group identity while the guards did not is important in itself. But some of the most interesting findings in the study have to do with the consequences of this contrast. These are summarised in Table 1 [PLEASE DOWNLOAD THE PDF VERSION FOR THE TABLE]. 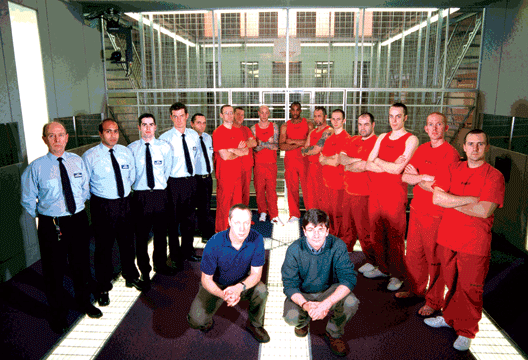 Amongst the prisoners, social identification led to agreement and mutual support. This in turn led to effective coordination, agreed leadership and organisational effectiveness. They worked together and were thereby empowered to turn their goals, beliefs and values into social realities. This collective self-realisation both increased the initial level of group identification and was in turn good for the psychological well-being of the prisoners. Their levels of depression and burnout decreased over time. They didn’t let the stressors in the situation overcome them but rather acted to eliminate the sources of their stress. In effect, they experienced the virtuous circle of social identification represented in Figure 1a [PLEASE DOWNLOAD THE PDF VERSION FOR THE FIGURE]. The contrast with the guards could not be greater. For them, lack of social identification led to disagreement and discord. There was no coordination amongst them, no leadership, no organisational effectiveness. They worked against each other and thereby lost any power they could have derived from the resources available to them. Their inability to impose their will led to a decrease in group identification and to rising levels of depression, burnout and internal dissent over time. Rather than their roles and resources allowing them to master the situation (and the prisoners), their lack of identity allowed situational stressors to master them. In this way, they were exposed to the vicious circle of social atomisation represented in Figure 1b [SEE PDF VERSION]. Overall, these findings suggest that, far from undermining agency, shared group identity provides the power that enables people to implement their beliefs and values (Turner, 2005). Such collective agency promotes the psychological well-being of individual group members. As the days went by, the prisoners in our study became more cohesive and powerful, while the guards became more fragmented and powerless. This continued to the point where some prisoners broke out of their cells and destroyed the old regime. Together, ex-guards and ex-prisoners then proposed their own regime: ‘a self-governing, self-disciplining commune’. At its outset, the Commune exemplified all the advantages of a cohesive group. This was no longer a category we had imposed upon our participants, but rather one they had created for themselves. They identified highly with the values and goals of the Commune and they worked energetically to implement these goals. Indeed, initially they worked harder and supported each other more than they ever had under the old system. However the Commune had a fatal flaw. While most participants supported it, some did not. And while the ‘Communards’ were willing to be self-organising they were unwilling to use power to discipline dissent. As a result, the Commune system began to break down. Its supporters became despondent as they became unable to turn their social beliefs into a form of social being – or, in the terms used above, as the lack of collective self-realisation became chronic. It was in this context that those who opposed the Commune – a combination of ex-guards and ex-prisoners – proposed reinstating the guard–prisoner system, but in a more tyrannical form (see the manifesto, reproduced for the first time on the contents page of this issue). This was disturbing. But what was more troubling was that, as our psychometric measures showed, those who had previously supported the Commune were themselves becoming more authoritarian and more sympathetic to autocratic leadership to the extent that they had reached the same levels of authoritarianism as the dissenters. As a result, those in the Commune showed limited resistance to the new tyranny. This is where, for both ethical and practical reasons, we terminated the study. So what started with our participants rejecting a relatively mild form of inequality had ended on the brink of an authoritarian world of their own making. How had this happened? The crucial step is to recognise that social identities, and the norms and values associated with them, are related to the practical ways we organise our everyday world. Where they empower us to create the worlds we value (as for the prisoners in the first phase of our study), they engender positivity. Where we fail to use group power to organise our world effectively (as for the Communards in the second phase), then group beliefs become, quite literally, useless. So, because the Communards remained suspicious of the exercise of group power, they were unable to transform democratic ideals into working democratic structures. As a result, these ideals came to seem more of a hindrance than a help. By contrast, any system that promised to work – even a tyranny that had previously seemed deeply unattractive – gained in allure. The tragedy of the Communards was that their own fear of using power created the conditions where power could be misused against them. For all the twists and turns in the BBC study, there are two findings that are constant throughout. The first is that shared social identity creates social power, and where people are willing to deploy that power they become effective social agents who shape their own worlds. The second is that where people are unable to shape their world – either because they lack shared identity and hence power or because they have shared identity but fail to deploy the power that flows from it – they are liable to become despondent and open to alternative belief systems, however extreme they might be. Conceptually, this viewpoint is diametrically opposed to that which the Stanford Prison Experiment is typically used to advance. Groups, we suggest, give people choice rather than take it away. And the ability to exercise choice is good for our well-being. How people exercise their choice will depend upon the norms and values they subscribe to. Hence the impact of groups upon the health of society is not given in our psychology but is rather something for which people must take responsibility. All members of a group, from the highest to the lowest, play a part in determining what the group stands for and the type of world it seeks to create. Conversely, the failure of groups, and the consequent lack of collective power, removes choice from people, and this is bad for the well-being of individual members. It is also bad for the health of society. For that is when people become more liable to accept extreme suggestions and thereby succumb to inequitable solutions to their social problems. That is when ordinary people and erstwhile democrats can be seduced by tyranny. In short, do groups and power corrupt? Not in and of themselves. But the failure of groups does corrupt absolutely. These are, of course, big and bold claims. We don’t expect everyone to accept them without demur. Indeed Zimbardo (2006) himself remains implacably opposed to our analysis. We have provided a detailed response to his criticisms (Haslam & Reicher, 2006), but we welcome the debate. Our major ambition in undertaking the BBC Prison Study was to reopen normal scientific investigation and discussion around the relationship between group processes and extreme behaviours. We have put our data and our conclusions into the public domain and others can now judge these for themselves (or, even better, advance the debate through their own research). As Turner (2006) notes in his commentary on our study, social psychologists have been locked into a negative view of groups and a narrow understanding of tyranny for far too long. As he points out, a key and undeniable contribution of our study is that it encourages us to ‘escape our theoretical prisons’ – forcing us to address new questions and to look at old questions in new ways. As social psychologists, clinical psychologists, organisational psychologists – or even better, all together – it is high time to reconsider the relationship between group processes, individual well-being and healthy societies. - Stephen Reicher is a professor of psychology at the University of St Andrews. E-mail: [email protected]. - Alex Haslam is a professor of psychology at the University of Exeter. E-mail: [email protected]. Do people in groups inevitably abuse positions of power – and, if so, are they to blame? Would society be healthier if we encouraged people to act as individuals, not as group members? Should we seek to have an integrated understanding of social, clinical and organisational psychology, and do we have the theoretical and methodological tools to achieve this? Ellemers, N., Spears, R. & Doosje, B. (1999). Social identity: Context, content and commitment. Oxford: Blackwell. Haslam, S.A. (2001). Psychology in organizations: The social identity approach. London: Sage. Haslam, S.A. & Reicher, S.D. (2005). The psychology of tyranny. Scientific American Mind, 16(3), 44–51. Haslam, S. A. & Reicher, S.D. (2006). Debating the psychology of tyranny: Fundamental issues of theory, perspective and science. British Journal of Social Psychology, 45, 55–63. Haslam, S.A. & Reicher, S.D. (in press-a). Social identity and the dynamics of organizational life: Insights from the BBC Prison Study. In C. Bartel, S. Blader & A. Wrzesniewski (Eds.) Identity and the modern organization. New York: Lawrence Erlbaum. Haslam, S.A. & Reicher, S.D. (in press-b). Stressing the group: Social identity and the unfolding dynamics of stress. Journal of Applied Psychology. Reicher, S.D. & Haslam, S.A. (2006). Rethinking the psychology of tyranny: The BBC prison study. British Journal of Social Psychology, 45, 1–40. Reicher, S.D. & Haslam, S.A. (in press). On the agency of individuals and groups: Lessons from the BBC Prison Study. In T. Postmes & J. Jetten (Eds.) Individuality and the group: Advances in social identity. London: Sage. Reicher, S.D., Haslam, S.A. & Hopkins, N. (2005). Social identity and the dynamics of leadership: Leaders and followers as collaborative agents in the transformation of social reality. Leadership Quarterly, 16, 547–568. Sutherland, J. (2005, 31 October). Abu Ghraib need not have happened and the Stanford Prison Experiment got it wrong. The Guardian (G2), p.24. Tajfel, H. & Turner, J.C. (1979). An integrative theory of intergroup conflict. In W.G. Austin & S. Worchel (Eds.) The social psychology of intergroup relations (pp.33–47). Monterey, CA: Brooks/Cole. Turner, J.C. (1981). Some considerations in generalizing experimental social psychology. In G.M. Stephenson & J.H. Davis (Eds.) Progress in applied social psychology (Vol. 1, pp.3–34). Chichester: Wiley. Turner, J.C. (2005). Explaining the nature of power: A three-process theory. European Journal of Social Psychology, 35, 1–22. Turner, J.C. (2006). Tyranny, freedom and social structure: Escaping our theoretical prisons. British Journal of Social Psychology, 45, 41–46. Zimbardo, P. (2006). On rethinking the psychology of tyranny: The BBC prison study. British Journal of Social Psychology, 45, 47-53.